That story of Avengers: Infinity War will be a coming of age tale for Teen Groot, and it looks like the young sapling might find a new mentor somewhere in the film’s massive roster. Will that make Rocket jealous? In an interview with Yahoo Movies published Wednesday, motion capture artist Terry Notary confirmed that he’s playing the teenage version of Groot we first saw in the Vol. 2 post-credits scene. Notary spoke mostly about his new film, The Square, but also offered up sparse details about working with Marvel. Notary called the experience “really, really fun” and essentially confessed that Groot’s arc will be a classic Bildungsroman: “I can’t say too much about him, but he’s coming of age, so you’ll see the teenager find a mentor to look up to and to model himself after.” Leading up to Vol. 2, director James Gunn said that the Guardians of the Galaxy were “the worst parents in the entire world!” We saw their abuse and neglect in Vol. 2, so we can probably assume that none of them will be this “mentor” figure. Teen Groot has some sass in the post-credits scene of the second 'Guardians of the Galaxy' film. If you’ve ever met or been a teenager (hint: you definitely have), then you know that teens often find their coolest mentors outside their family. (Look at the way the slightly immature Peter Parker idolizes Tony Stark.) Teen Groot will probably find one of the Avengers “to look up to and to model himself after.” Hawkeye? Black Widow? Iron Man? 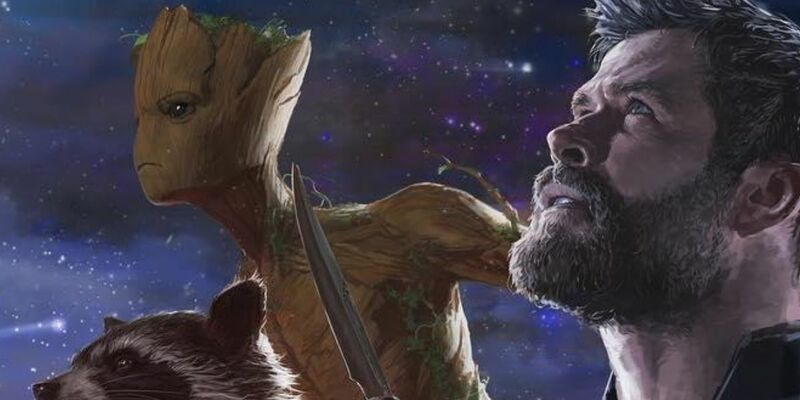 We can’t possibly know who Groot’s role model will be, but considering that of all the Avengers, it’s Thor he meets first (according to the unreleased trailer), maybe the Norse god will be the one to take the young sapling under his wing. The two of them do appear rather close to one another in the Infinity War poster — not that proximity matters at all when you’ve got Doctor Strange next to Mantis. Do the groupings on this poster matter at all? Notary’s most prominent roles include playing King Kong in the latest Skull Island film and Rocket in the Planet of the Apes film franchise. Coupled with a lengthy ape scene in The Square, the actor has a lot of experience monkeying around. Maybe we’ll get a wilder, more animalistic kind of Groot in Avengers: Infinity War? Avengers: Infinity War will be released April 25, 2018. Ever wonder how the Guardians travel so dang fast? Check out this video about wormhole travel in Guardians of the Galaxy Vol. 2, according to a theoretical physicist.